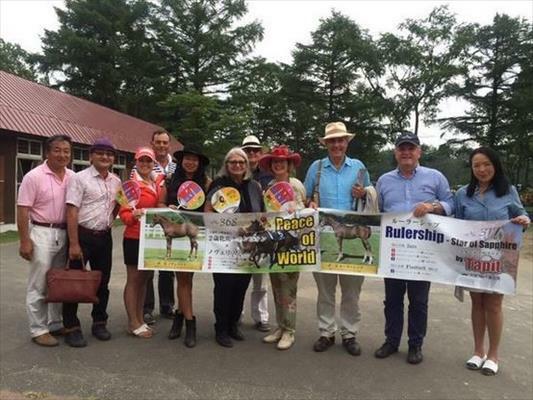 Waterhouse famously claimed her first Melbourne Cup in 2013 with Fiorente and the desire for a second took her to a horse sale in Hokkaido, Japan, in July 2015. With Japanese-bred horses considered among the best stayers in the world, Waterhouse purchased a yearling and five weanlings. An investor in four of the weanlings was Craig Thompson, owner of the WA-based Mount Hallowell Stud and owner of the Waterhouse-trained Pornichet, a French import that won the Group 1 Doomben Cup in May 2015. Two of the Japanese weanling colts were by Novelist while the others were by Workforce and Rulership, at an aggregate cost of $1.12 million. The horses stayed at the vendors’ properties, as a condition of the sale, until final payment for purchase was made in March 2016. Gai Waterhouse celebrates her Japanese purchases, including Hush Writer. The quartet spent the following 18 months maturing before entering pre-training in Hokkaido. But they didn’t race there, as Japanese racing regulations make it difficult for established racehorses to be exported permanently for overseas racing. It was at this point that the $350,000 weanling by Workforce strained a tendon and was sold. That left the Thompson-Waterhouse combination with three colts. The three were sent to France, joining the stables of Criquette and Freddy Head. Over the last Australian summer the two Novelist colts (Wolfe and Kushiro) were sent to Australia, without a start in France, arriving at Werribee’s quarantine centre in February. The Rulership colt, named Hush Writer, remained in France and was switched to the Chantilly-based stables of Francis-Henri Graffard. The $250,000 purchase has created a big impression from three French starts. Hush Writer contested the Prix Juigne (2100m) at Longchamp on April 24, a race restricted to three-year-old colts and geldings on debut that’s been won by future Group winners Zambezi Sun, Spiritjim and Last Train since 2007. Hush Writer finished second to the Bugle Major who remains unbeaten after two starts. The Godolphin-owned Impulsif, who finished third in the Prix Juigne, couldn’t have been more impressive at his next start at Deauville on August 9, winning over 1900 metres by an ever-widening four lengths. And the fourth placegetter named Attorney also won his maiden next time out, over 2400 metres at Clairefontaine on July 7. Attorney was then snapped up by OTI Racing. Hush Writer would win his maiden over 2000 metres at Longchamp on May 27, beating Folamour, who went on to run fourth in the Group 1 Grand Prix de Paris (2400m) in July. Hush Writer’s most recent start saw him finish an unlucky third, beaten a neck after being held up for much of the straight, in the €130,000 ($A205,000) Group 2 Prix Hocquart (2400m) at Chantilly on June 17. Waterhouse and Thompson had seen enough and the horse travelled from Chantilly, via Newmarket’s quarantine centre to Werribee on July 28. As a northern-hemisphere three-year-old, Hush Writer will be looking to follow in the hoofsteps of last year’s Melbourne Cup winner, Rekindling. Whilst already past the first ballot clause courtesy of his placing in the Prix Hocquart, a berth in the Cup field is likely to only occur if he can beat older, more experienced rivals at stakes level within the next two months. There’s no doubting his quality but the odds are stacked against him due to those time constraints. However, should Hush Writer force his way into the field, the son of Rulership is sure to have assembled a large group of supporters in the process and may appear ‘thrown in’ at the weights come Cup day. Cristian Demuro (8), 58kg, $6, 1.25L, 2:16.47. Pierre-Charles Boudot (7), 58kg, $2.10, 1.5L, 2:08.42. Cristian Demuro (4), 58kg, $18, 0.3L, 2:29.51. ~ Also published in Winning Post newspaper.